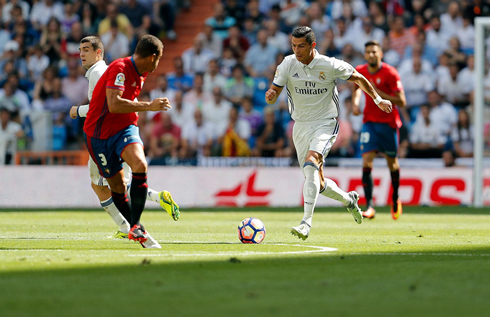 The international break seems to have had a positive effect in Madrid as the Merengues hosted and beat Osasuna 5-2 today at the Bernabéu. Cristiano Ronaldo scored the opener and saw Danilo, Ramos, Pepe and Modric also adding their names to the scoresheet. 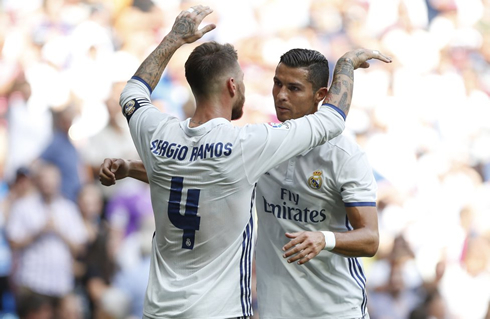 Three games and three wins in La Liga, as Real Madrid went on to beat Osasuna 5-2 at the Santiago Bernabéu this Saturday afternoon. The day also marked Cristiano Ronaldo's return from injury, with the Portuguese star completing a 2-month recovery period following the injured he suffered in the European Championship final last July 10. And what better way to return to competition than scoring a goal for Real Madrid just 6 minutes after kickoff? Ronaldo opened the flood gates with the first goal of the game, as many had predicted, making things easier for his team to secure a comfortable win. It wasn't exactly a struggle for Madrid against newly-promoted Osasuna, but at times, the Merengues made it harder than it had to be against the side from Pamplona. In the end the 5-2 victory would take Madrid and Zidane even closer to the all-time record for consecutive wins in La Liga. There were a couple changes in today's side with some of Madrid's internationals being given a rest. Marcelo, James and Casemiro were all left off the squad list, as was Isco who is still working to recover from a minor injury. But two parts of the BBC were back. Ronaldo into the starting lineup and Benzema on the bench. And it would take Ronaldo a mere 5 minutes to get his name on the scoresheet, netting from close range after a perfect square from Gareth Bale on the right. 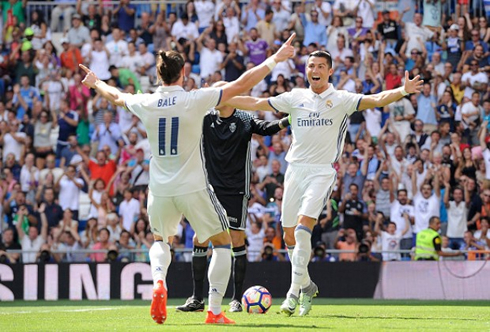 In the scorching Madrid sun, both teams tried to conserve energy and at times in the first half, the game seemed to drag on. Real Madrid however, would begin to take charge. A smart scoop from Ronaldo to Morata would lead to a good save, but the ball fell to Danilo who then buried a shot from just inside the box. And just before the end of the half, captain Sergio Ramos would make it 3-0 with a trademark header from a Toni Kroos corner. In the second half more goals would come. Pepe would score from a corner as well, poor keeping from the Osasuna custodian there, and Modric would place a brilliant strike past the keeper from outside the box. Osasuna wouldn't lie down however with Oriol Riera and David Garcia making things a little interesting but Madrid were always in control and kept their perfect start to the new La Liga season intact. 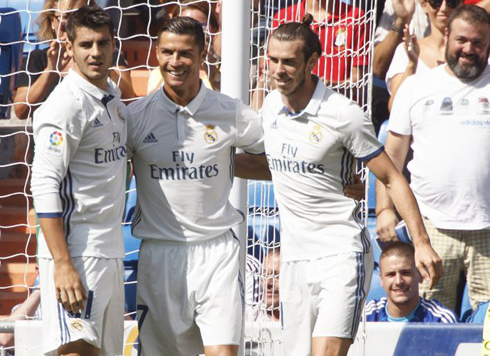 Attackers: Gareth Bale, Cristiano Ronaldo, Alvaro Morata. Cristiano Ronaldo next game for Real Madrid is for La Liga on September 10 of 2016, against Osasuna. You can watch Juventus live stream, Real Madrid vs Sporting CP, Barcelona vs Celtic, Swansea City vs Chelsea, Aston Villa vs Nottingham Forest, and Werder Bremen vs Augsburg, all matches provided from our soccer live game pages.